BlasterMedia:S&K MD US SonicJam manual.pdf, called Pon-pon (ポンポン) in the Japanese manualMedia:S&K MD JP SonicJam manual.pdf, is a Badnik from Sonic & Knuckles found trundling around in Flying Battery Zone. 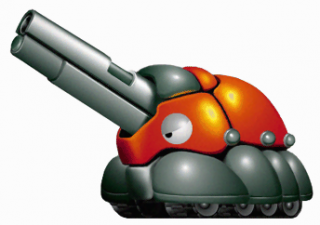 They appear to be based off of a Hercules beetle, and fire small projectiles at the player from their horn-like cannon, which harmlessly bounce off any shield type. A simple jump is enough to permanently dispatch them. They resemble the Blastoids found in Hydrocity Zone and behave in the same manner. Since Sonic 3 and Sonic & Knuckles were one single game split in half, the Blaster was listed by accident in the Sonic 3 manual's Badnik section.Media:Sonic3 MD US SonicJam manual.pdf The Badnik itself even remains unused in Sonic 3's data, though its programming isn't quite finished as its projectiles can be destroyed with a jump or Spin Dash like regular Badniks. They return in the Wii U/PC version of Sonic Lost World where they appear exclusively in Desert Ruins Zone 2, but with a different design and attack pattern: they move backwards on the mach-speed routes of the stage and, instead of shooting projectiles directly at Sonic, they shoot honey at the screen, temporarily obscuring the player's vision. They also return in Sonic Mania, found in Flying Battery Zone again and returning to the original attack pattern from Sonic & Knuckles.